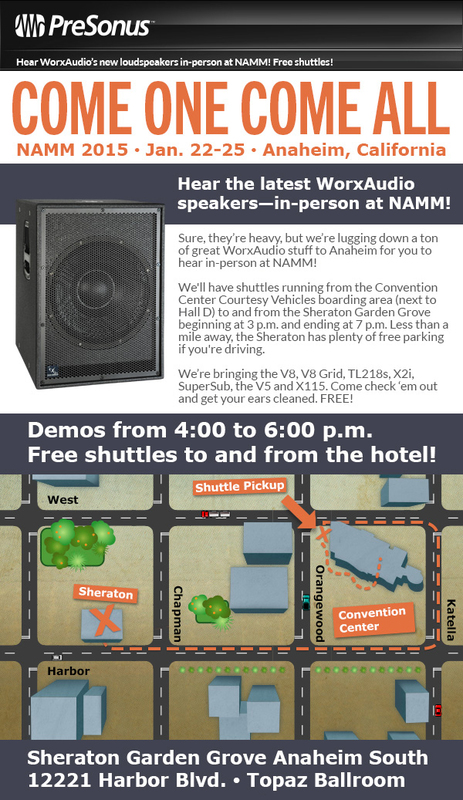 We will be offering a FREE demo of WorxAudio’s new speakers in Anaheim during the NAMM show, and it’s so free that you don’t even need a NAMM badge. This event will be held in the Topaz Ballroom of the nearby Sheraton, a mere stone’s throw from the convention center. But hey, we understand that you’re going to be spending a lot of time on your feet at the show, so we’ve arranged lots of shuttles. They’ll be available to pick you and your tired feet up from the Convention Center Courtesy Vehicles boarding area, next to Hall D, and will run from 3-7 p.m. Click here to register and get more info. Demos will be held from 4-6 p.m. all four days of the show. 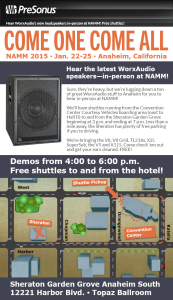 We’re bringing the V8, V8 Grid, TL218s, X2i, SuperSub, the V5 and X115. Come check ‘em out and get your ears cleaned.